For gardening, one of the most important tools is a garden hose. The best garden hose should be immune not only to wear and tear but also high water pressure. Most importantly, they should not kink as that is an indicator of a low-quality hose. Garden hoses have improved a lot, especially when you compare them with those old vinyl pipes we used back in the day. The nozzle is able to offer different kinds of sprays and pressures too, which make them great for washing and gardening and what makes them a multipurpose tool. A garden hose is something that gets used often, so it should not need to be replaced from time to time. It should not leak but expand easily with water pressure. Wondering where you can find such? We’ve got your back. Below are three of the best ones we found currently available on the market. Check out each one to find the model that suits your gardening needs and preferences. The Hospaip Garden Hose boasts everything you could ask for in a garden hose. The Hospaip goes down to a third of its length when not in use and expands using water pressure. It stretches for up to 50 feet when in use and without causing any leaks. Moreover, it features a double layer of latex inside. For superior durability, it is covered in a high-quality polyester fabric. The ¾ inch solid brass ends will never rust. It also features leak-proof, anti-rust alloy punch underneath the ends. The optimal temperature range for the hose is 41° to 113° F.
The zinc alloy spray nozzle is great at its job. It has eight different settings including vertical, center, full, cone, shower, mist, stream, and flat. These should cover most of your gardening needs. Also, the nozzle has a rubberized coating that makes the grip better. When it comes to water pressure, this garden hose has a capacity of three to 12 bars. This goes to show how sturdy this hose really is. In fact, this one is so strongly built that you can even walk on it without breaking it. There is a shut-off valve as well to control the water flow. This is a lightweight hose weighing only 3.35 pounds. It does not kink and is incredibly easy to store. You can just roll it and put it in the bag, which comes with the purchase at no extra cost. This product is an expandable garden hose that is designed to make gardening convenient and simple. When expanded, it can reach a whopping 50-foot length effortlessly. This happens when the water is on. As soon as the water is off, the hose shrinks back to almost a third of 50 feet. This makes it easy to store as well when not in use. The shut-off valve is right at your fingertips. You can turn the water on and off as and when you need, unlike with traditional pipes where you have to run to the faucet to shut off the water. 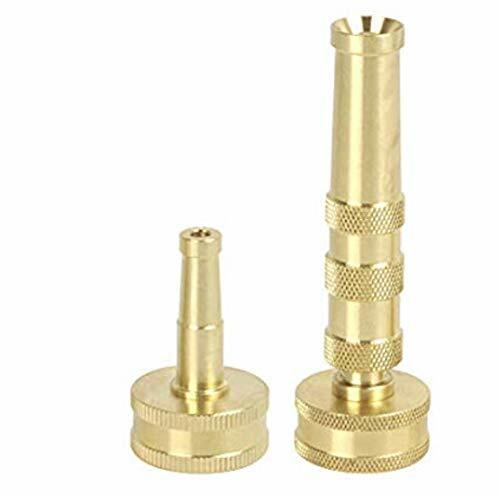 The 3/4th brass connectors are high-quality and keep the water from leaking. The pipe is made of latex, which means it is highly resistant to breaking or leaking. This hose comes with a versatile eight-function nozzle that meets all your gardening needs. You can turn the nozzle to get the kind of pressure you need. The eight settings include shower, vertical, flat, full, cone, center, and mist. Whether you are cleaning the front yard, washing your car, or watering the plants, you will get the right water pressure and outcome. There is no tangling issue with this hose too. It is also super lightweight, which makes it easy to carry around and use for extended periods. Its weight is just 2.85 pounds. If you are looking for a sturdy garden hose, then the FlexiHose has your needs covered. This garden hose uses the best materials. It boasts a 3750D fabric, which is impervious to bursts and handles high pressure well. It also has a four-layer latex, which makes it even tougher. The brass connectors, as well as the materials, ensure that there is no leak whatsoever. In fact, the company gives a lifetime guarantee regarding leaks, which shows their confidence in their product. As it comes with a lifetime guarantee, you are basically good for life with this, and if it breaks, you can claim a replacement. You get all that for a very affordable price as well. It comes with a hose hanger, storage bag, three sealing rings, and of course the spray nozzle. The ABS nozzle is perhaps its best feature. It has nine different settings, which you can choose from with just a twist. It can be used for virtually everything from cleaning to watering plants. This hose expands to 75 feet, which is more than enough to cover up a big garden area. When not in use, it has a length of no more than 17 feet. Also, it is super easy to work with as it does not tangle up. It is quite elastic in that sense. The water pressure strength of this hose is up to 12 bars while the temperature capacity is 113° F.
MOST ADVANCED AND STRONGEST GARDEN HOSE：We have developed this hose using the best materials: 3750x3750D Fabric ,It can avoid bursts, At the same time,4-layer latex is 3x more durable than 2-3 layers,also Made from the highest-quality materials & latest design, The FlexiHose is the most functional, lightweight & flexible hose that money can buy! The 50ft length is long enough to make it easy and convenient for maneuvering around the garden, even when full of water! 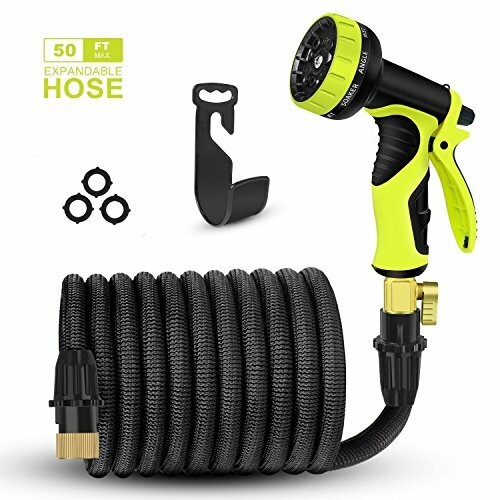 FREE 9-PATTERN ROTATING HOSE NOZZLE:Made of studry ABS,effectively in preventing water leakage and prolonging the service life.Select right type of spray pattern, the hose is great for garden watering, house/floor washing, pet cleaning, car washing, having fun or business use. 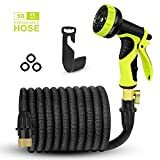 FLEXIBLE DESIGN,Easy to stock -Usage and storage is a breeze thanks to the incredible expanding design, this retractable garden hose starts out from 17 Feet; when the water is turned on the hose quickly expands up to 3 times in length (50 Feet) with the water pressure (3-12 Bar) and returns in minutes to its original length when the water is out. Just make sure there is enough water pressure to expand the hose. QUALITY GUARANTEE:We're so confident in the quality of the garden hose kit and , that we're proud to offer an unparalleled LIFETIME REPLACEMENT GUARANTEE. If you ever have any issues with your FlexiHose, simply contact us and we'll expedite you a new one absolutely free or refund your payment in full! These are the top choices for consumers looking for a functional and long-lasting garden hose. The FlexiHose stands out among the three as it has all the right features combined with high-quality materials. However, if you are looking for something even longer, then go for the 75-foot one. The valve on the FlexiHose and Hosepaip comes in very handy, which is a big advantage over the other one. All three pipes depend on pressure to fully expand so unless you connect it to a pressurized water source you might not get the full length of the hose. They are designed to last, but you have to be careful and ensure that they do not tangle. Wind them every time after use and hang or store them in the bag. All of the three hoses offer great value for money and are backed by guarantees. The companies stand by their products and want to offer guaranteed satisfaction. Basically, when it just comes down to choosing the best garden hose, the length is the deciding factor.